How annoying it is when you find a new kitchen tip and realised you could have saved yourself so much time and hassle over the years previously. Like this one I discovered last Saturday. 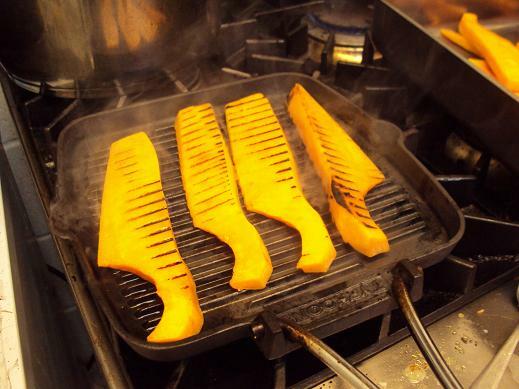 Grilling butternut squash can be troublesome - you need to hold it down on the grill or it barely makes contact - just warps in the middle the way fish does. All you need is a weight on top - like a second grill pan you've been given. This pushes the squash (or whatever else you're grilling) onto the grill so you get the grill marks and more inportantly, the taste. This way you can leave it to itself for a few minutes and carry on with the other 10 things you're trying to do at the same time. Then you just need to turn them over.